Wish all readers a Happy Gudipadwa and Ugadi. Ugadi (Telugu new year) and Tamil new year are around the corner. Generally we make a menu which has all the six tastes,sweet, sour, salt, spice, astringent and bitter with naturally available ingredients. I have posted neem flower rasam, mango pachadi, raw mango rice, mango pickle and obbatu |poli recipes. Since mangoes started coming in the market i decided to make mango payasam. I love vermicelli payasam so i decided to make mango vermicelli payasam. In a pan add ghee and roast the semiya into golden brown. I used roasted vermicelli. Add the milk to this and boil in a medium flame and stir it often. Ensure it should not get burnt. Take out 1 tblsp of milk and soak the saffron (if adding). 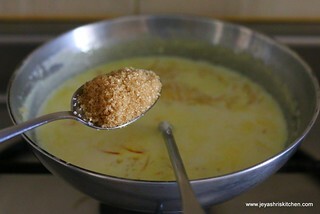 After 5 minutes add the saffron milk to the pan. Cook till the milk reduces and the vermicelli gets cooked. Do not make it too thick. Once this is cooled it will become thick. So when it is in the kheer | payasam consistency switch off the flame. Add sugar to this. alternatively you can add condensed milk too. This will give a richness to the kheer. After adding sugar the kheer will get slightly watery, it's ok , once it is cool it will be alright. Do not boil after adding sugar. But if using condensed milk you can add while adding milk itself. Allow this to cool completely. Meanwhile peel the skin of the mango and chop them roughly. Reserve a small portion of mango and cut them into cubes. This is for garnishing. I used Alphonso mangoes. You can use any variety of mangoes or use mango pulp too. I love the bright yellow colour of the alphonso mangoes. I have used in many of my mango dessert recipes. 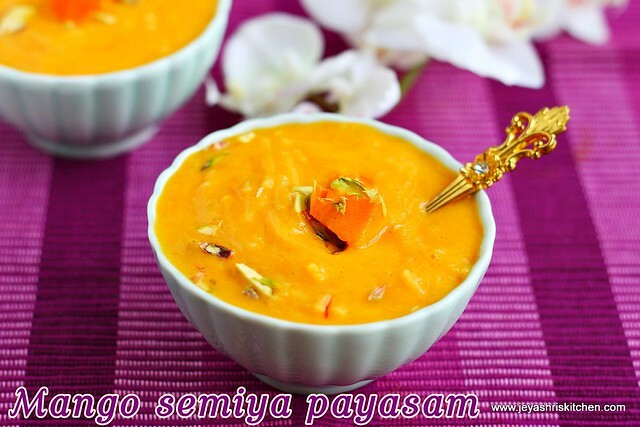 Once the payasam is completely cool add the mango puree to the semiya payasam. Garnish with pistachios. 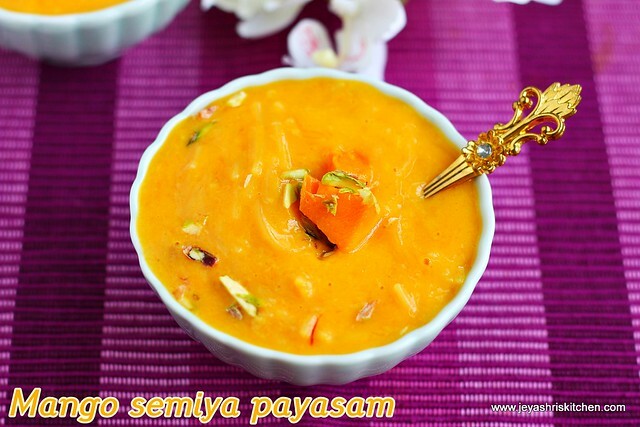 Do not add the mango puree even if the payasam is slightly warm. It may curdle the payasam. Keep it chilled. While serving garnish with some fresh mango pieces. This payasam is totally addictive. It tasted awesome even more the next day. Always add the mango puree when the payasam is cool. You can replace vermicelli with sago too. You can roast cashew nuts in ghee and add it to the payasam. jeyashri, love your blog! so helpful when I want to make something different. Wish you all the best and many accolades.